Thanks to the steady march of technology into the world of education, it’s a great time to be a lifelong learner. Today, there are a growing number of platforms that allow us to search and discover (quality) learning content, across a wide variety of topics. Plus, thanks to the advance of technology that enables the speedy production and distribution of video at scale, the traditional barriers to learning are being torn down — learning is visual and it can happen anywhere. Sites like TED, Khan Academy, Skillshare, CreativeLive, Coursera, Udacity, EdX, Udemy, Lynda.com are all great examples — and the list goes on. But something is still missing. Perusing the Web, one quickly finds that the learning platforms lean toward more academic subjects and mastery — online classes and courses — but what about more practical learning content and instruction? Sure, YouTube is rife with “how-to” videos, but separating the signal from the noise can take a lot of time. It’s this problem (or opportunity) that led Justin Kitch to launch Curious back in May. Having built and sold early website creation platform Homestead to Intuit, Kitch saw an opportunity to capitalize on the rise of video-based education and offer curious minds, hobbyists and lifelong learners a place to peruse and find how-to content on any subject. Like a combination of Skillshare and Udemy, Curious essentially aims to be a marketplace of how-to videos, allowing those experts and those who want to teach with those eager to learn from them. However, the key, Kitch tells us, is to do so in a way that’s more targeted, navigable and interactive than YouTube. And, what’s more, to differentiate from the Skillshares and Courseras of the world by serving those practical, how-to lessons in a short, bite-sized format that makes it easier to engage with and consume — or so the thinking goes. The content on Curious covers a wide swath of topics, from how to grow organic asparagus and brew beer to the best way to flirt in a foreign language and perfect one’s salsa dancing technique, ranging from five to fifteen minutes in duration. Since launching in May, Kitch says that Curious has posted over 2,000 lessons on 100 different topics, which have together collected over 400K views. Going forward, the goal, he says, is to continue to expand the scope of the platform horizontally and vertically — to both increase the range of subjects covered, while increasing the depth of popular subject areas by adding content that cover sub-topics and offers alternative methodologies. Last week, however, with its foundation on the Web established, Curious took its first step into mobile with the launch of an iPad, allowing users to access its video library and learning platform while on the go. 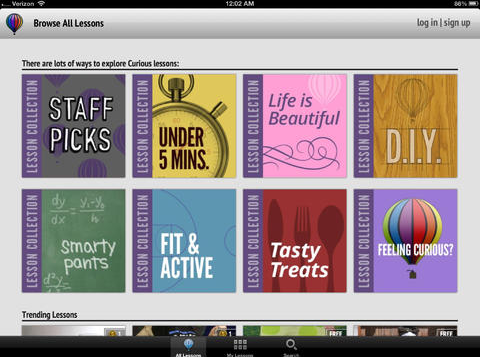 The app allows users to sync the lessons they watch on the Web with the app, pausing a video started at work to pick up and watch on the train home, for example. 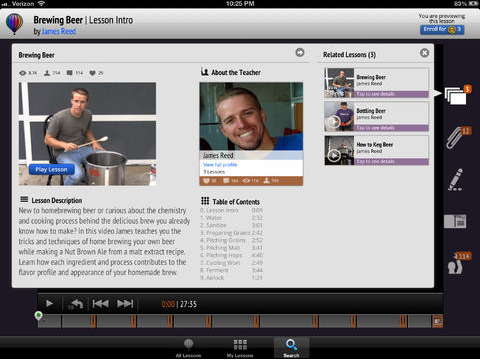 The key, really, is the very mobility that access to its video library on the iPad app allows — in other words, if users are watching a how-to cooking video, now they can bring the lesson into the kitchen. 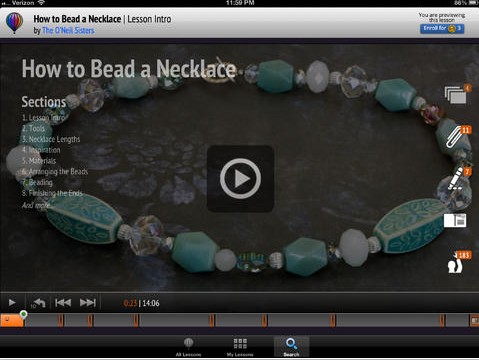 Furthermore, rather than rely on YouTube to beef up its catalog of lessons, Curious has built its own proprietary video platform that gives the startup a little defensibility in the ever-increasing world of video-based education. In practice, this sets the foundation for the other ways the platform wants to differentiate itself from YouTube and other educational sites, meaning that users can not only watch videos and leave comments, but film videos of themselves performing whatever task or lesson it may be and upload them to the site so that the teacher can give feedback on their technique. The platform puts a low ceiling on how much teachers can charge, keeping prices in the single-digits. On the one hand, this may mean less incentive for teachers, but it also keeps the barrier to entry low for the average learner. Much lower, in fact, than YouTube, which is currently experimenting with paid subscriptions to channels and the like. For now, all of the content on Curious is free, but Kitch says paid lesson functionality is coming soon, along with apps for other platforms and devices — though those are a bit further off. While the platform has taken big strides in just a few months — and it’s still early in the game — Curious could run into problems as its model forces it to make certain concessions. The key for Curious is to scale quickly, adding as much content as it can, across a wide variety of subjects as quickly as possible. Of course, this tends to happen at the detriment of quality and quality control. Though of course, as it scales it will also be able to attract better teachers, giving it a leg up over YouTube and other video platforms. As of now, Curious has a team that works individual instructors to help them optimize their videos (and how they teach) for the platform and only accepts teachers who meet a certain quality standard. But such a high-touch process could be difficult at scale, however, Kitch did tell us that the startup has built and will eventually release tools for teachers that will automate the video creation and uploading process — a la Udemy. As of now, the overall quality of content across the site is fairly high, but it is true that some of its lessons could easily be found on YouTube. That doesn’t necessarily have to be a negative thing, however, as simply having a dedicated destination for how-to videos is enough of a reward over having to tackle the colossus that is YouTube. The Web is sorely in need of a platform that’s dedicated to easily-consumable how-to content and lessons, which immediately differentiates it from sites like Lynda.com. If you want to learn how to code, you’ll probably go to Lynda.com, Treehouse or another platform that offers dedicated instruction, video-based or not. Kitch also sees other video-based learning sites as potential collaborators rather than all-out competitors — a perspective that could benefit the company as incumbents continue to grow and new sites continue to emerge. In the short term, Curious is helping itself stand out by building out features that allow collaboration and interaction around its content. For example, as of now, the platform enables learners to download attached files, view a list of (and purchase) related materials, reach out to and collaborate with other students and send teachers “Curious Cards” that contain those videos and photos of what they’ve learned. It’s not quite disrupting higher education, but there’s a huge opportunity in continuing education, especially if it can convince people that it’s the go-to destination for life-long learning. The company has raised $7.5 million in Series A financing from Redpoint Ventures, former Apple Chairman Bill Campbell and Jesse Rogers, including a personal investment of $500K from Kitch himself. To check out Curious for iPad, find it here.